Hera is China best men's toupees, man wigs, male hair replacement, male hair pieces manufacturer and wholesaler. The HHT2 cap design toupee is full PU base, which you will feel full PU cap toupee very well if you are bald and the hair like grown from your own scalp. 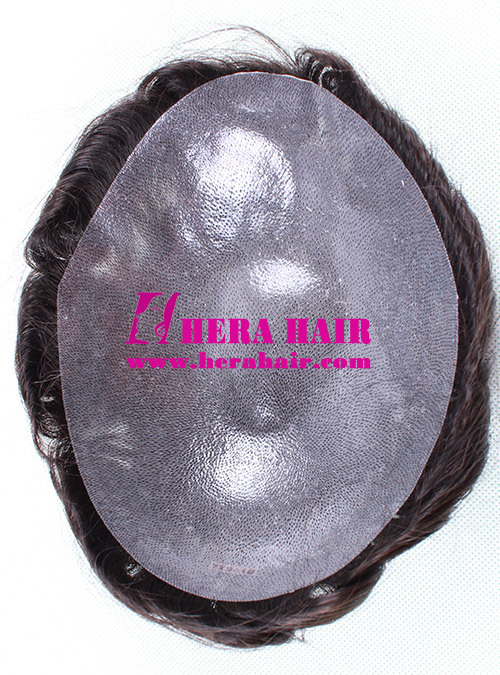 Hera not only supply all kinds of cap design men's toupees, we also supply all kinds of hair materials for your choice, such as regular Indian remy hair, Chinese virgin hair and better quality Indian virgin hair, Brazilian virgin hair, Malaysian virgin hair, European virgin hair etc. Except single color hair toupees, we also can do different color mixed gray hair toupees, which is natual white hair effect for old man. We also supply human hair mixed synthetic hair toupees according to your requirement. Hera mainly wholesale man toupees, lace wigs, Jewish wigs and hair extensions in China, so we welcome hair salons, hair replacement centers and toupees retailers to contact us for business cooperation. In order to let more peoples enjoy our toupees, we also supply custom toupees service for customer. You can send your special requirement details to us online or by email. We will contact with you in first time. Normally speaking, you need to confirm the toupees cap design (such as HHT2), cap size (such as 7*9), hair materials (such as Indian virgin hair), hair length (such as 6inches), hair color (#1 mixed gray hair) and quantity then we can offer you directly.